This coming Sunday, November 17, marks the birth of Soviet psychologist Lev Semyonovich Vygotsky (1896-1934). Vygotsky is best known for the development of cultural-historical theory and for his contribution to various psychological fields: educational psychology, developmental psychology, psychology of art and others. Vygotsky belongs to that group of authors that every student in psychology in Russia should know about. Being in the archives at CHP, I naturally wanted to know what content could be found here. I started my search with using finding aids and inventories to look for material concerning the members of the so-called Vygotsky circle. Its most famous members are Soviet psychologist and neurophysiologist A.R.Luria and Soviet developmental psychologist and founder of the “theory of activity” A.N.Leontiev. I found multiple entries for these individuals in a variety of materials including correspondence, tests, conference materials, drawings, and postcards. 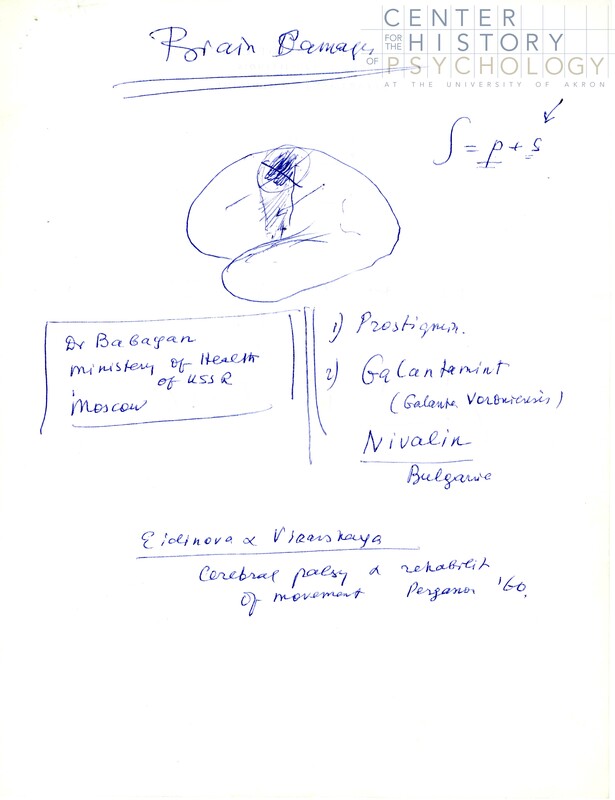 A sketch of the brain by Luria, undated. Images of Moscow 1959. These belonged to Luria and were given to Ward C. Halstead. At the second stage of this project I decided to enlarge my search to seek out as many Soviet and Russian psychologists and physiologists in the archives as possible. Soviet physiologists: I.P.Pavlov, V.M.Bekhterev, P.K.Anokhin. Soviet psychologists: D.N.Uznadze, A.A. Smirnov, A.V.Zaporozhets. Russian students of Kurt Lewin: Bluma Zeigarnik, Tamara Dembo and Gita Birenbaum. Russian immigrant psychologists: Maria Rickers-Ovsiankina, Gregory Razran, Jacob Kasanin, Gleb Anrep, Eugenia Hanfman, N.I. Oseretsky. 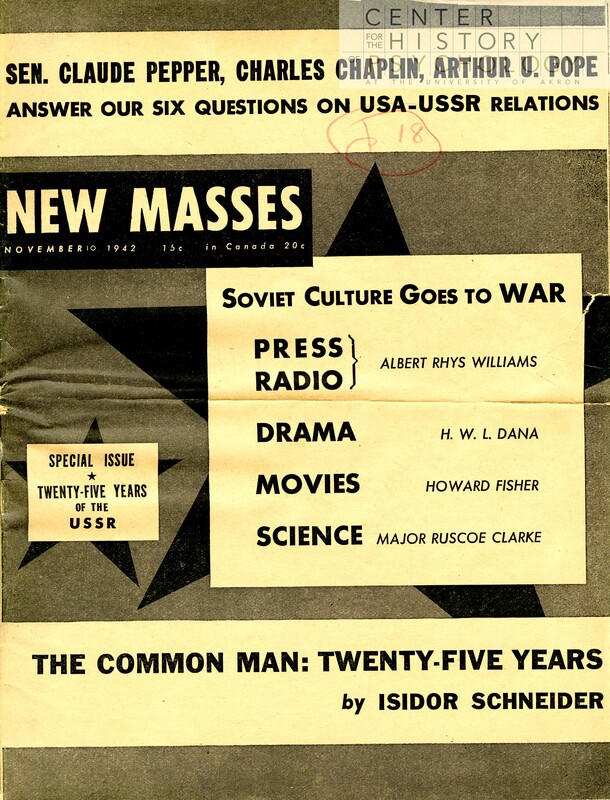 A special issue of “New Masses”, November 10, 1942. The issue is dedicated to 25 years of the USSR. 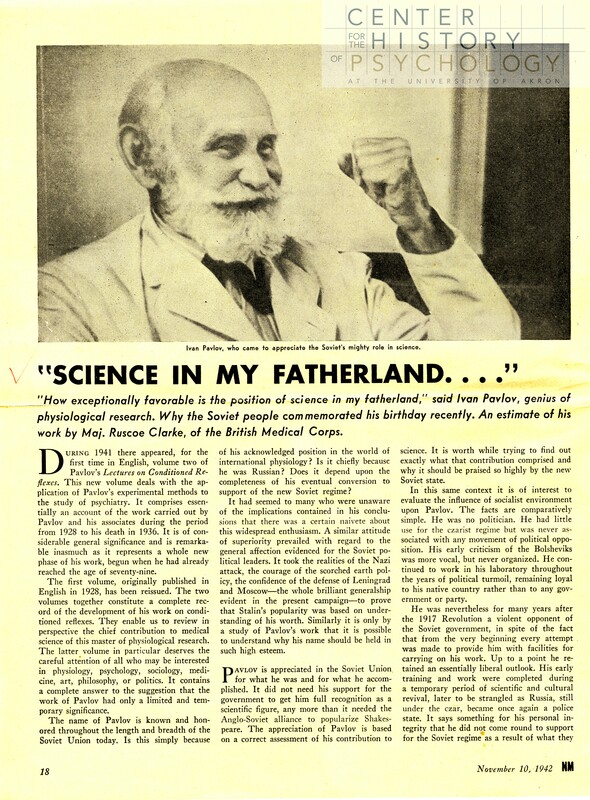 First page of an article about Ivan Pavlov in “New Masses”. Very often, Soviet psychology is portrayed as being separate and isolated, whereas various materials suggest that there existed multiple connections between Soviet, American, and European psychologists. The influence was mutual: on the one hand many Soviet scientific achievements became popular and acceptable abroad, and on the other hand, foreign psychologists had an impact on the development of Soviet psychology. What is particularly interesting is how many of these connections were established: personal correspondence, professional relations growing into long lasting friendship, trips and personal visits. Letter from Luria to Molly Harrower. 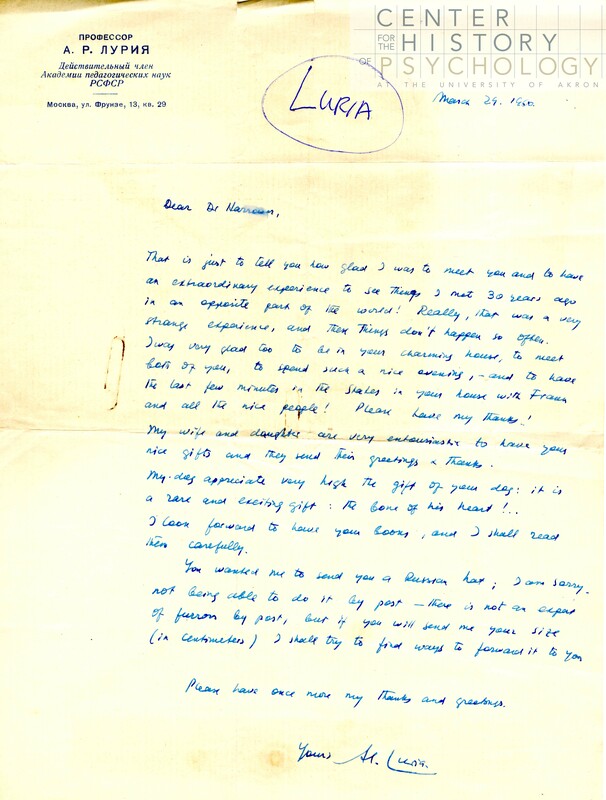 Letter from Harrower to Luria. New Years card sent from Luria to Harrower. 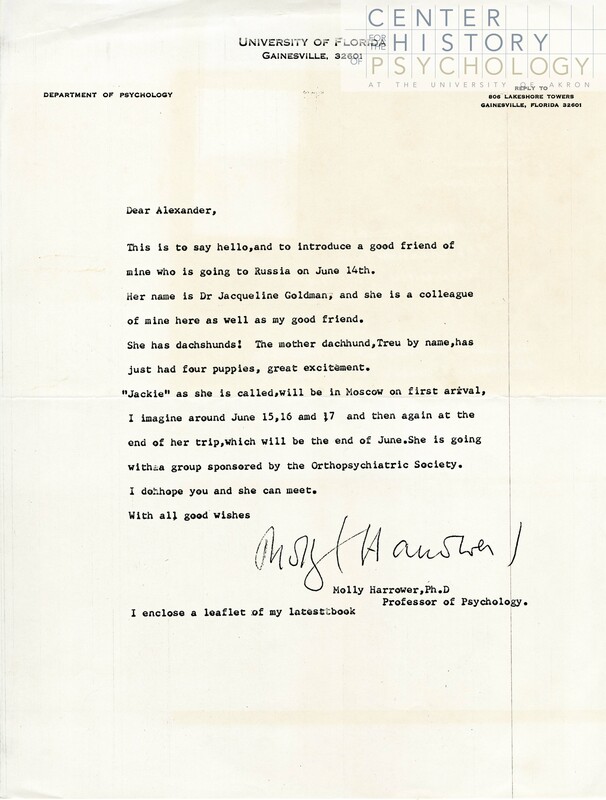 Tracing these connections between psychology internationally has much to add to our understanding of the history of the field. For me, examining the archival records of Soviet psychology has given me a sense of the history of Soviet psychology, but it has also really shifted my perspective on Soviet scientists. Browsing through the documents of famous scientists somehow makes them seem less like far-off geniuses that you admire in textbooks and published material, and more like real, interesting people! We are now receiving Book of the Month contributions from students and interns! Adam Beckler is an undergraduate student assistant with Reference & Digital Projects. He is a Junior at the University of Akron studying Political Science and History. 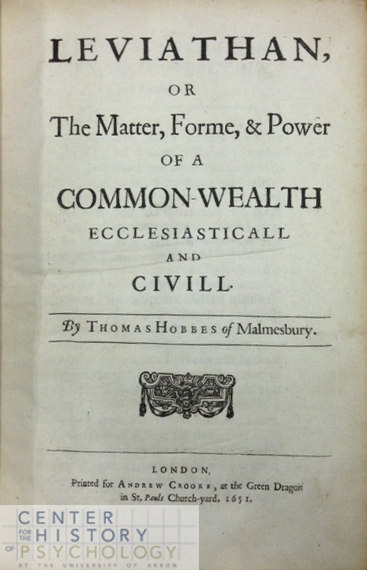 This is the question that Thomas Hobbes set out to answer when he wrote Leviathan, or the Matter, Forme, & Power of a Common Wealth Ecclesiastical and Civill. Having lived through the English Civil War, Hobbes did not write in a political vacuum. England’s national struggle over who had the right to rule resulted in the beheading of King Charles I and served as the impetus for the publication of Leviathan. 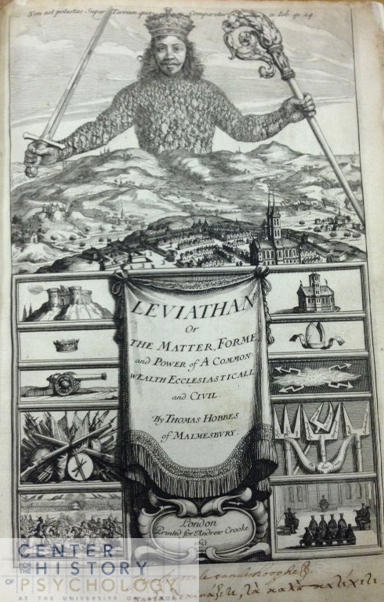 The Center for the History of Psychology has a rare, genuine first issue of Leviathan, published in London in 1651. The authenticity of this first issue can be told by the woodcut ornament on the title page, which consists of a winged head and pots of flowers. According to Hobbes, men give up freedom to commit violence in order to gain protection from violence. This is the nature of political authority. As a student of political science and history, I have studied Leviathan in multiple classes. That it is still studied on its own merits and not as a historical document is a testament to the intellectual legacy of Thomas Hobbes. Leviathan is significant to me because it represents an early attempt to answer fundamental questions about mankind and the civil society that we take for granted. While the answers will not satisfy everyone, simply thinking about these questions can make us collectively better off.